Enjoy the Schuylkill Soiree - with a special deal for Grid readers! 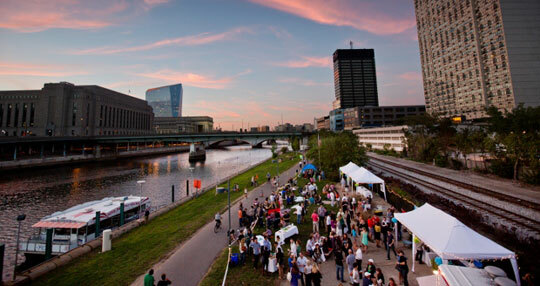 This Saturday, the Friends of Schuylkill Banks will host their annual end of summer fundraiser, Schuylkill Soiree, by the Walnut Street Bridge, featuring games, live music, food trucks and drinks. The beautiful Schuylkill Banks trail and greenway are a great public space for runners, bikers, walkers and loungers. This event will be raising money to help support and maintain these invaluable spaces while enjoying them for an evening before things get too chilly. Relax on the banks and enjoy the refreshments to really close out summer with a bang. The Dapper Dog, Delicias, and Pure Sweets will all have their trucks present with dogs, arepas, and pastries. The event will also feature Leinenkugel beer from Tenth and Blake, and beats from DJ Eddie Tully. Bring a blanket or lawn chair and watch the sun set over the Schuylkill.